S0718. 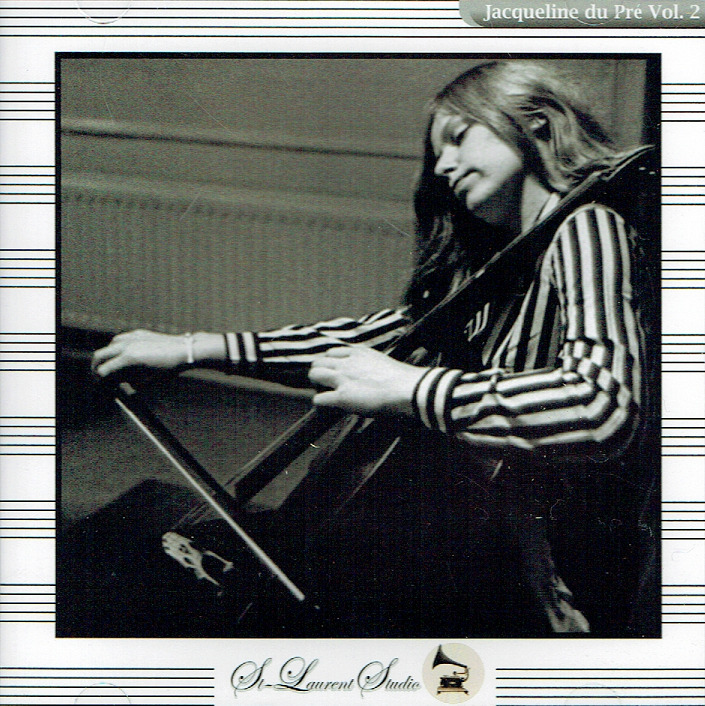 JACQUELINE DU PRE, w.Martin Turnovsky Cond. NDR S.O. 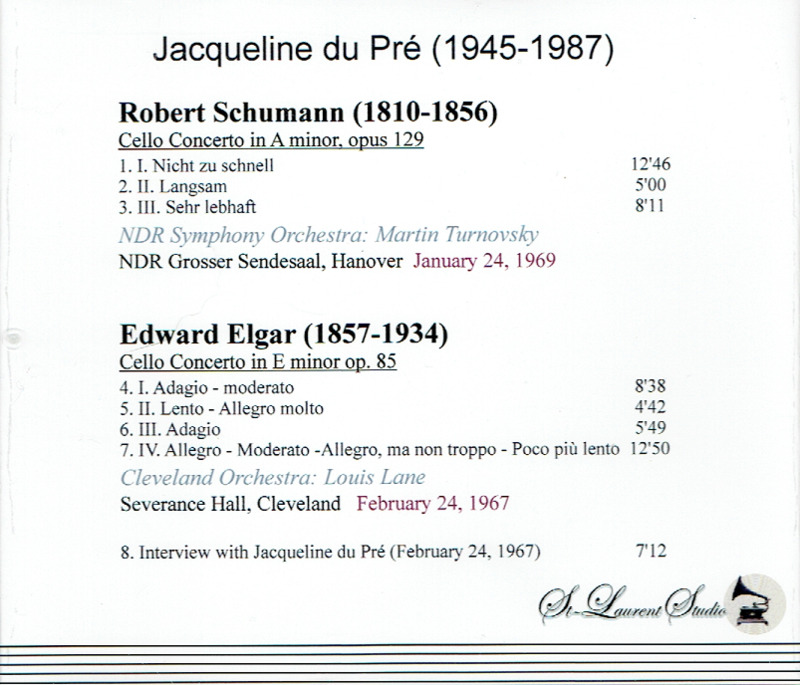 : Cello Concerto in a (Schumann), Live Performance, 24 Jan., 1969, Hanover; w.Louis Lane Cond. 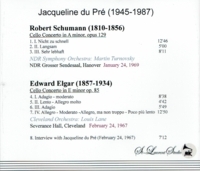 Cleveland Orch: Cello Concerto in e (Elgar), Live Performance, 24 Feb., 1967, Severance Hall; Martin Perlich interviews Jacqueline du Pré, 24 Feb., 1967. [Nirvana summons once more! Another true jewel, captured in a glorious acoustic!] (Canada) St Laurent Studio YSL T-693. Transfers by Yves St Laurent. “Jacqueline du Pre, a brilliant and charismatic English cellist whose career was cut short by multiple sclerosis, had a career that lasted barely a decade. But during her prime she was recognized as one of the world's leading cellists, and served as a role model for many young musicians. During the late 1960s and early 1970s, Miss du Pre and her husband, the conductor and pianist Daniel Barenboim, seemed a charmed couple. Often compared with Robert and Clara Schumann, they were admired for their energy, musicality and youthful glamour. Miss du Pre's playing was characterized by an unusual mixture of elegance and ferocity. ' ‘Miss du Pre is a cellist in the modern vein’, Harold C. Schonberg wrote in THE NEW YORK TIMES after a 1967 concert. ‘There is plenty of strength to her playing, and a good measure of romanticism without the romantic string mannerisms of portamento and a fast wide vibrato. She can produce a mellow sound of unusual size and clearly was born to play the cello’. Miss du Pre excelled in a wide variety of music, specializing in the sonatas of Johannes Brahms and the concertos of Haydn, Boccherini, Schumann, Dvorak and Saint-Saens. She had a particular affinity for English music, and made memorable recordings of the Delius and Elgar concertos. The Elgar was associated more closely with her than with any other cellist since Beatrice Harrison, who died in 1965. Raymond Ericson, reviewing a 1965 performance of the Elgar work for THE TIMES, observed that ’Miss du Pre and the concerto seemed made for each other, because her playing was so completely imbued with the romantic spirit. Her tone was sizable and beautifully burnished. Her technique was virtually flawless, whether she was playing the sweeping chords that open the concerto, sustaining a ravishing pianissimo tone, or keeping the fast repeated note figures in the scherzo going at an even pace’. The first signs of Miss du Pre's illness appeared when she was 26 years old and at the height of her fame. ‘My hands no longer worked’, she recalled in 1978. ‘I simply couldn't feel the strings’. She withdrew from concertizing for one year, then returned, to mixed reviews. The diagnosis of multiple sclerosis followed shortly, and Miss du Pre retired. ‘I had to learn to reconstruct my life’, she said in 1978. ‘But I have found a great deal to do. I go to concerts and see my friends. And the music is still alive in my head’. Jacqueline du Pre was born in Oxford, England, on Jan. 26, 1945. Her talent was obvious from an early age, and she began cello lessons when she was 5 years old. Her early teachers included Herbert Walenn and William Pleeth; she later studied with Paul Tortelier, Mstislav Rostropovich and Pablo Casals. At the age of 11 she won her first competition, and she eventually took every possible prize for cellists at the Guildhall School of Music. Her career began in earnest in 1961 when she played a concert at Wigmore Hall in London using a 1672 Stradivarius that had been presented to her anonymously. ‘She was immediately acclaimed for her instinctive feeling for style and breadth of understanding as well as technical proficiency’, Noel Goodwin wrote in the NEW GROVE DICTIONARY OF MUSIC AND MUSICIANS. When Mr. Rostropovich first heard her play, he remarked that he had found somebody to carry on his work. Miss du Pre met Daniel Barenboim at a party in London in 1966. ‘Instead of saying good evening’, she later recalled, ‘we sat down and played Brahms’. They were married in June 1967. Together, they helped begin the South Bank Summer Musical Festival in London the following year.